As the primary caregivers for our young children we have an amazing opportunity to impact how they see the world. We have the chance to load them up with tons of images and factoids about the incredible places that exist and the vast array of people, animals, and foods that complement them. We can help them see the good that is there in all that God created before it has the chance to be overshadowed by the evil and corruption that often inundates and infiltrates our everyday news. My husband and I love helping our children discover the beauty in the world through books. 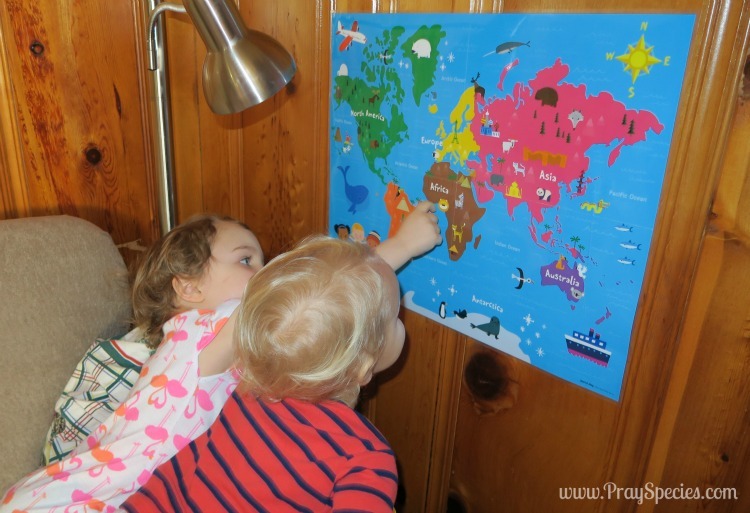 We started early with our eldest, pointing out where Madeline lives (Paris, France) on a map adhered to our family room wall. Even at three years of age, her joy and unique understanding of other places based on knowledge she gained in books, inspired me to look for other stories that would transport us around the globe. Before I got too involved in this project, a lovely lady by the name of Jamie C. Martin published a book that did it for me. And I’m so glad she did – this book clearly took tons of work and provides so much more information than my excel sheet could ever hope to provide me. 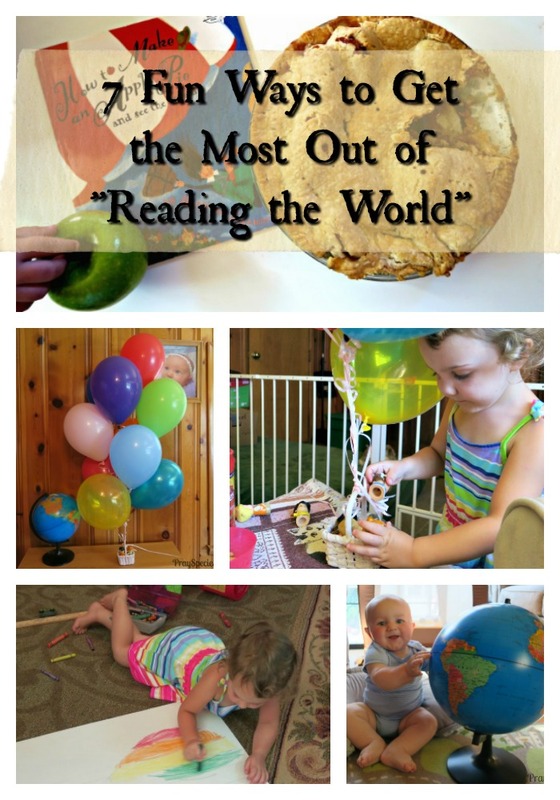 I love that she wrote this book and I love how much our family is enjoying her Summer Book Club – Give Your Child the World! Each Monday Jamie of Simple Home School and her co-host Sarah Mackenzie of Read-Aloud Revival are posting a handful of goodies that correlate with the week’s theme. This week, multicultural week, they shared several hand picked You Tube videos, maps, book log printables, recipes, and a few select toys to enhance the book club experience. Our family is personalizing this experience by selecting and sharing our favorite books for children ages 4-6 from Jamie’s list as well as a few from the ages 6-8 list. and praying for those around the globe. The first week of the Summer Book Club – Give Your Child the World is multicultural week. In Give Your Child the World, Jamie encourages families to implement practical strategies for inviting the world into your home. They range from including global themes in your decor to celebrating various globally inspired holidays. Our family has committed to incorporating one of Jamie’s ideas each week of the book club. and 3) we used a fun wall map to help the kids identify the locations discussed in the books. When I asked Ladybug how she would most like to see the world, she told me she would “prefer to travel via hot air balloon.” Using a large mixing bowl, a square board book, and a ruler we sketched a hot air balloon onto some spare white poster board. She used her crayons to make her hot air balloon all the colors of the rainbow. 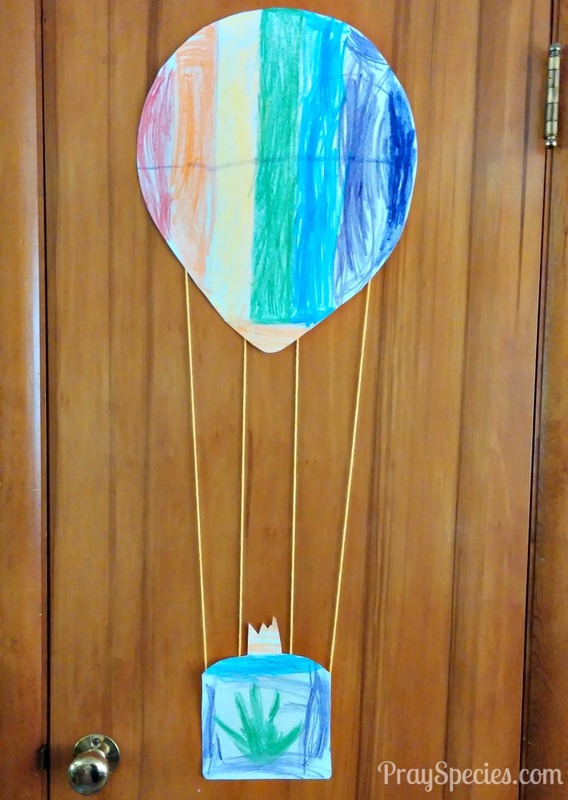 We cut out the hot air balloon, added some string, a little fire to “make it go,” and taped it to the door near our table as decoration for the duration of our book inspired journey around the world. 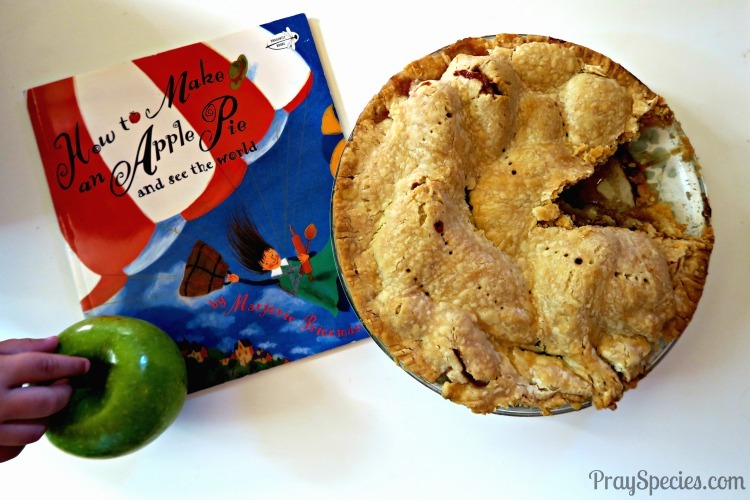 One of our favorite books this week was How to Make an Apple Pie and See the World, by Majorie Priceman. In a wonderful flurry of activity, the main character goes on a global hunt around the world using various modes of transportation to collect all the ingredients she needs to make an apple pie from scratch. Think reducing salt water from the sea for your salt from scratch. At the end of the book, there is a recipe for an apple pie. In this house you don’t read books or magazines with activities or recipes at the end of them without a little voice asking, “Can we try this?” Fortunately, all the ingredients were readily available at the local Kroger in East TN and we were able to make two little literary globe trotters very happy. 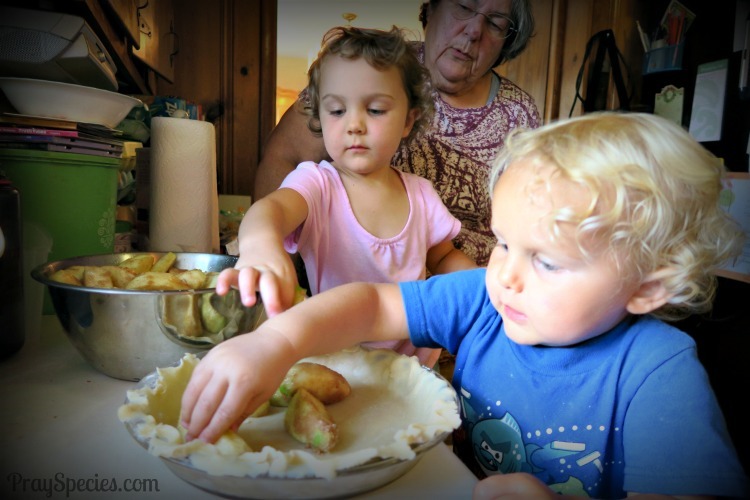 They enjoyed making the pie with Grandma even more than eating the result. Ladybug was very proud of her hot air balloon drawing/coloring. Both kids have since added travel the world via hot air balloon (most notably over Africa) to their bucket lists. Since they were intent on hot air balloon travel and the thought of juggling an infant, a toddler, and a preschooler while soaring over the ground in a tiny little basket scares me more than I can express (I celebrate when I make it through a church service with all of them alive, ya’ll……. ), Grandma and I found a fun, pretend alternative……for now. 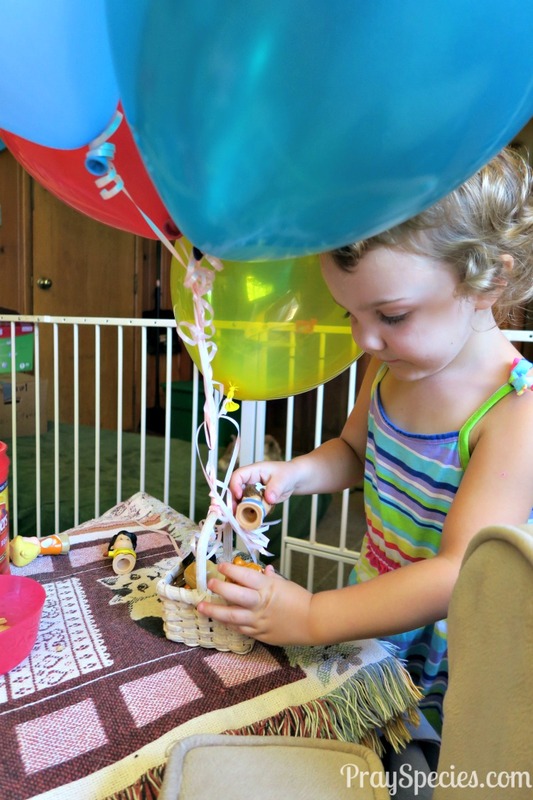 We located some cheap helium balloons and tied them to a miniature basket that we already had at home. Awaiting discovery by the kids!!! The basket was the prefect size for a couple of “little people;” our honorary world travelers. The kids were absolutely thrilled to have their very own hot air balloon that really went up in the air. and Antarctica (backyard (crazy, since it’s 98 degrees outside…lol….I’m taking note of a learning moment here…..LOL). This simple project/activity has inspired so much creativity in the kids and I love hearing their imaginary play – being chased by a rhinoceros (ever read the book Draw! by Raul Colon?) and preparing for a water landing! Hilarious and music to this Mama’s heart! I use songs a lot in our home school preschool. .
1. My kids are huge fans of signing time, so we were pleased to find this simple video from Mrs. Rachel. 2. This one is set to the music used for “The Other Day, I Met A Bear,” and there is a call and response format that my kids responded to well. 3. Finally, we found this set to the tune of “He’s Got the Whole World in His Hands.” This is one the kids responded to best. The video is clearly for use in a secular kindergarten class, so we redid the lyrics a little – see below the video for our words 🙂 Maybe one day Grandma and I will record our own You Tube video. He’s got North and South America in His hands. He’s got Europe, Asia, Africa in His hands. He’s got Australia and Antarctica in His hands. He’s got all 7 continents in His hands. Singing this song about the continents has been very effective – the kids have the names of the continents down. They frequently sing the song at bedtime after the lights go off and when swinging outside on their play gym. Win! Each week of the book club we plan to spend sometime reflecting on the many material and spiritual needs of the world. We have worked hard in our home to develop a culture of prayer. We pray for those who are sick or expecting. We are using this book club as a vehicle to introduce the concept of praying for others around the world. We started simple with a prayer the kids already say every night – the Our Father. on earth as it is in heaven……….. If you haven’t purchased your copy of Give Your Child the World I highly recommend you do so! In the meantime, follow us on Instagram and Facebook to see all the books and all the fun! The image below is perfect for saving on Pinterest!